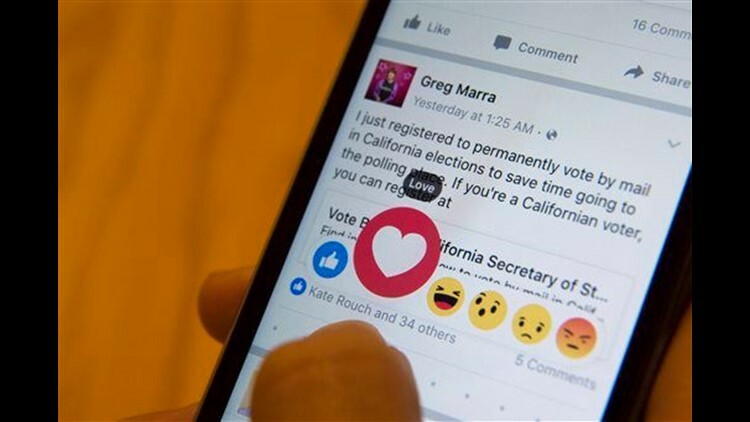 NEW YORK (AP) — Facebook's "like" button isn't going away, but it's about to get some company. Facebook has been testing alternatives to "like" in about a half-dozen countries, including Ireland, Spain and Japan. On Wednesday, Facebook started making "haha," ''angry" and three other responses available in the U.S. and the rest of the world. In changing a core part of Facebook — the 7-year-old "like" button has become synonymous with the social network — the company said it tried to keep things familiar. The thumbs-up "like" button will look just as it long has, without the other choices cluttering the screen or confusing people. You have to hold that button or mouse over the "like" link for a second or two for the alternatives to pop up. Facebook chose to offer more nuanced reactions — "love," ''haha," ''wow," ''sad" and "angry" — alongside "like" — to give users "greater control over their expressivity," says Julie Zhuo, Facebook's product design director. Facebook went through comments on friends' posts, as well as emoji-like stickers people were using. It chose the most common ones and tested those. Facebook considered dozens of reactions — but offering them all would have been confusing. Think of having to flip through pages and pages of emojis: Do you want one wink, a tear, a full frown or a half frown? Facebook ultimately chose these six reactions for their universal appeal — something that could be understood around the world. Even a generic happy face "was a little bit ambiguous and harder for people to understand," Zhuo says. Facebook already shows how many people like a post and lets you tap or click on the count for a list of people. With Reactions, you see how many people have reacted in some way, along with the top three reactions, such as "love" followed by "haha" and "wow." You can get breakdowns for each reaction — the total and specific people. If you don't update your app, you'll just see the number of likes. Once you have this, you can start marking older posts as "wow" or "sad," too. But Facebook wants to show what it thinks you're most interested in — and that might ultimately mean mostly happy posts, rather than ones that evoke sadness or anger. Zhuo says Facebook will tweak its formulas based on how people respond.